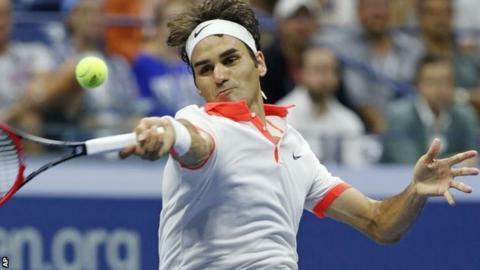 Five-time champion Roger Federer won a battle of the serves to beat John Isner in round four of the US Open. Swiss Federer, seeded second, won 7-6 (7-0) 7-6 (8-6) 7-5 and set up a quarter-final against French 12th seed Richard Gasquet. Fifth seed Stan Wawrinka beat American Donald Young and will next face Andy Murray's conqueror, Kevin Anderson. In the women's draw, Britain's Jo Konta lost to fifth seed Petra Kvitova while second seed Simona Halep progressed. Isner had not lost his serve for the entire tournament, until his very last service game. The American had held on for 56 straight service games until Federer, who had already won two tie-breaks, clinched the match when Isner sent a volley wide. "John has one of the best serves in the game, especially the pace on his second serve, which is unreal," said Federer. "I guess you've got to hang around and make sure you don't drop your own serve." The 34-year-old, chasing an 18th major title, goes on to face Gasquet, who beat Czech Tomas Berdych 6-2 3-6 6-4 6-1. French Open champion Wawrinka earlier beat Young 6-1 1-6 6-3 6-4 on Arthur Ashe Stadium. The 23-year-old Romanian had looked destined to join the growing ranks of retirees when she called for the trainer for a leg issue after losing the first set against Sabine Lisicki. However, Halep fought back to win 6-7 (6-8) 7-5 6-2 on Louis Armstrong Stadium and will play Victoria Azarenka in the quarter-final. "My back was cramping, then the leg was worst," said Halep. "I feel it. I feel pain. But tomorrow I have day off so I have time to recover." Kvitova brought Konta's 16-match unbeaten run to an end with a 7-5 6-3 victory and will next meet Italian Flavia Pennetta, who saw off Australia's former champion Sam Stosur 6-4 6-4. There was much bemusement around Flushing Meadows when former finalist Azarenka, 26, stepped out on to Arthur Ashe Stadium wearing bandages on her biceps. They did not appear to hinder the 20th seed, who celebrated her 6-3 6-4 win over American Lepchenko with an on-court dance afterwards. The Belarusian, twice a beaten finalist at Flushing Meadows, also revealed the reason for the patches, saying: "I got a blister from rubbing against my shirt. It's a little embarrassing." Australian Open junior finalist Katie Swan had to be helped from court six in some distress. The 16-year-old, from Bristol but based in Kansas, required medical attention for around 10 minutes after losing the first set in 30C heat against France's Tessah Andrianjafitrimo. Swan was wrapped in ice towels, had her blood pressure taken and was advised not to continue, but the teenager wanted to try. She was unable to carry on when trailing 7-6 (7-5) 3-0 after one hour and 22 minutes, but was said to be recovering well with the on-site medical staff. "I'm sorry, I don't think you can play with it any more but if you come back we'll give you a shirt you can use. Come after and I will give you something." Stan Wawrinka offers the boy who got his broken racquet another Swiss souvenir. "I'm going to look for something that matches a little better. I got to keep my swag on." Victoria Azarenka is pondering her next wardrobe decision. "I have strong legs, so it is OK." Simona Halep reassures those worried that she hits herself with her racquet during matches. "Actually I'm starting to like it. It's good. It's not like Wimbledon, of course." Two-time Wimbledon champion Petra Kvitova is learning to love New York. "The weapons that I like to use against pretty much every single player doesn't seem to bother her." Sam Stosur concedes the game plan needs adjusting after a seventh defeat in seven matches against Flavia Pennetta.